Welcome to another #SundaySupper! Today’s theme is finger foods. I’ve been researching spring recipes, and when I saw this I knew it would fit perfectly with the finger food theme. It goes together quickly and uses two of my favorite spring vegetables: Spinach and green onions! To prepare filling: Place spinach with water still clinging to the leaves in a large pot. Cover and cook over medium heat until the spinach is wilted, about 5 minutes. Drain and refresh with cold water. Squeeze the spinach dry and chop. Heat 1 Tablespoon oil in a medium nonstick skillet over medium heat. Add scallions and cook, stirring, until softened, 2 to 3 minutes. Transfer to a medium bowl and stir in the spinach, feta, Parmesan, dill and lemon juice. Season with salt and pepper. Stir in 2 egg whites. Position rack in upper third of oven; preheat to 350F. Lightly coat a baking sheet with cooking spray or line with parchment paper. To make phyllo rolls: Whisk egg white, 2 tablespoons oil and salt in a small bowl. Lay one sheet of phyllo on a work surface with a short side toward you. Brush the lower half of the sheet with the egg-white mixture and fold the top half over. Brush the top with the egg-white mixture. Repeat this step with the second sheet of phyllo and set it on top of the first. Spoon one-fourth of the spinach filling along one long edge of the phyllo stack. Tuck in the short sides and roll up, jelly-roll fashion. Place on the prepared baking sheet. Repeat with the remaining phyllo, egg-white mixture and filling, making 4 rolls in all. Brush the tops of the rolls lightly with the egg-white mixture and sprinkle with seeds, if desired. Bake until golden, 25 to 30 minutes. Cool for 5 minutes. With a serrated knife, cut each roll diagonally into 9 pieces and serve hot. The Verdict: The flavor was great, but I could have used a dipping sauce. Perhaps a garlic infused mayo would have taken this to the next level. But I will definitely make it again! Yum! These are some of my favorite flavors! You are making my mouth water. I have not had anything like this in awhile. Thanks for the great recipe. Great hand held Greek flavor treats! 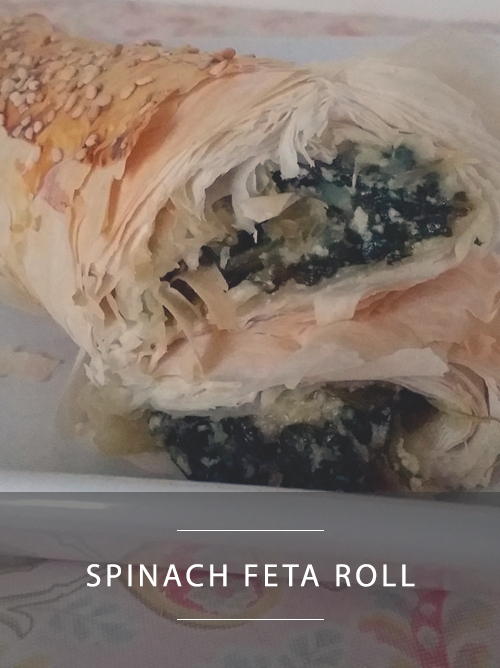 In my opinion, you can never have too much feta and spinach combos! 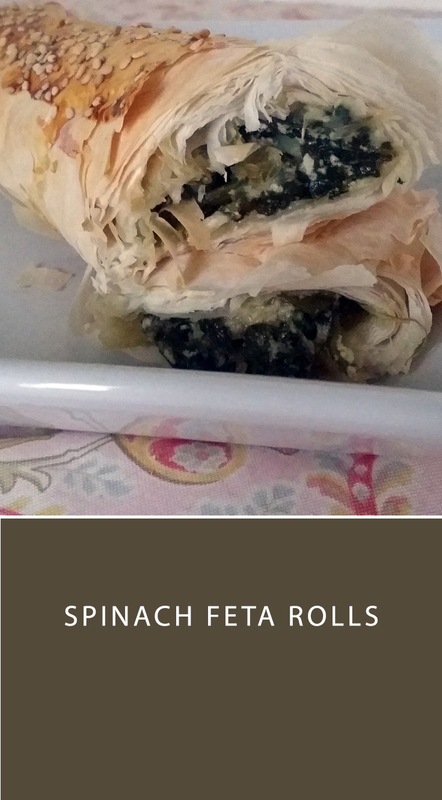 It’s my favorite tri-fecta of phyllo, spinach, and feta. Those three together means I’m heading to this plate FIRST!